In 1986, American winery owner Nicholas "Nick" Parker and British wedding gown designer Elizabeth "Liz" James meet, fall in love, and get married over the course of a transatlantic crossing on the Queen Elizabeth 2. After the birth of their identical twin daughters, Annie and Hallie, they get divorced and each has sole custody of one girl. Nick raises Hallie in Napa Valley, California and Elizabeth raises Annie in London, England. Eleven years and nine months later in the summer of 1998, Nick and Elizabeth coincidentally send their daughters to Camp Walden, a girls sleep away camp in Maine. Annie and Hallie, who do not know each other, take an immediate dislike to one another. After a series of pranks, they are isolated together as punishment until camp is over. They eventually discover that they are twins and hatch a plan for each to meet the parent they have never met. Hallie imitates Annie's British accent and flies to London to meet their mother, grandfather, Charles and Martin the butler. Annie imitates Hallie's American accent and flies to Napa Valley to meet their father, housekeeper Chessy and Sammy the dog. After discovering that their father is engaged to child-hating gold-digger Meredith Blake, Annie and Hallie plot to reunite Elizabeth and Nick by falsely telling Elizabeth that Nick wants to meet her in San Francisco. Chessy, Martin, and Charles discover the girls' secret plan. Nick is shocked, but delighted to see Elizabeth after so many years. Meanwhile, Chessy and Martin are growing romantically attracted to each other. Despite the girls' best efforts, which include recreating the night their parents met, they fail to reunite Nick and Elizabeth. They resort to a last-ditch effort by demanding a three-day family camping trip, refusing to reveal which twin is which until after they return. Elizabeth tricks Meredith into taking in her place on the camping trip. Annie and Hallie play a number of pranks on Meredith, who becomes enraged after waking up in the middle of the lake on her air mattress and gives Nick an ultimatum; choose either the girls or her. Nick, finally seeing Meredith for who she truly is, chooses the girls over Meredith, but being a responsible father, still punishes them for their mischief. Nick and Elizabeth realize they still have feelings for one another, but decide it is better to go their separate ways. Elizabeth and Annie later board a flight for London, but when they arrive, they find Nick and Hallie waiting for them (having taken a faster flight on the Concorde). Nick realizes his previous mistake was not going after Elizabeth when she left him, and proposes to her. Photos show Nick and Elizabeth getting remarried aboard the Queen Elizabeth 2, with Annie and Hallie as bridesmaids, and Martin proposing to Chessy. Lindsay Lohan as Hallie Parker and Annie James, eleven-year-old twin sisters who were separated after birth. Following their parents' divorce, they were raised separately with no knowledge of each other's existence -- until they meet at summer camp by chance. Dennis Quaid as Nicholas "Nick" Parker, Annie and Hallie's father, a wealthy American winemaker. Natasha Richardson as Elizabeth "Liz" James, Annie and Hallie's mother, a wealthy British wedding gown designer. Simon Kunz as Martin, the James family's butler, who falls in love with Chessy. Ronnie Stevens as Charles James, Elizabeth's father and Annie and Hallie's maternal grandfather. After he catches Hallie on the phone with Annie, she tells him about switching places. Lisa Ann Walter as Chessy, the Parker family's housekeeper, who meets and falls in love with Martin. She also discovers that "Hallie" is actually Annie after noticing her strange behavior. J. Patrick McCormack as Les Blake, Meredith's father. Joanna Barnes as Vicki Blake, Meredith's mother. Elaine Hendrix as Meredith Blake, a 26-year-old publicist who is planning to marry Nick. Polly Holliday as Marva Kulp Sr., the owner and manager of Camp Walden. Maggie Wheeler as Marva Kulp Jr., Marva Kulp Sr.'s daughter and assistant. Lohan's mother, Dina, and siblings, Michael, Aliana and Cody, all appear in uncredited cameos at the airport. Michael also appears in the movie as a boy who accidentally winds up at Camp Walden, mistaking it for a boys' camp. Erin Mackey was Lindsay's stunt double for Annie and Hallie. Joanna Barnes, who in the original 1961 film played Vicki Robinson, appears in this film as Meredith's mother Vicki. Principal photography started on July 15, 1997, in London, United Kingdom, and continued in Napa Valley AVA, San Francisco, Lake Arrowhead, and Los Angeles, California. The instrumental music featured prominently in the hotel scene where the girls and their parents cross paths serendipitously is "In the Mood", which was previously made famous by the Glenn Miller band. Later in the hotel, Hallie sings a few bars of "Let's Get Together", a tune from the first version of the film that was a hit for its star, Hayley Mills. The song is also quoted over the Walt Disney Pictures logo, and at the end of Alan Silvestri's closing credits suite. The tune playing as Hallie and Annie are making their way up to the Isolation Cabin is the main theme from "The Great Escape" by Elmer Bernstein. 1.^ Not featured in the motion picture. The review aggregator website Rotten Tomatoes reported an 86% approval rating with an average rating of 6.8/10 based on 50 reviews. The website's consensus states: "Writer-director Nancy Meyers takes the winning formula of the 1961 original and gives it an amiable modern spin, while young star Lindsay Lohan shines in her breakout role." Metacritic gave the film a score of 64/100, based on reviews from 19 critics, indicating "generally favorable" reviews. Gene Siskel and Roger Ebert each gave the film three stars. Critic Kenneth Turan called Lindsay Lohan "the soul of this film as much as Hayley Mills was of the original", going on to say that "she is more adept than her predecessor at creating two distinct personalities". Lohan won a Young Artist Award for best performance in a feature film. In its opening weekend, the film grossed $11,148,497 in 2,247 theaters in the United States and Canada, ranking #2 at the box office, behind Saving Private Ryan. By the end of its run, The Parent Trap grossed $66,308,518 domestically and $25,800,000 internationally, totaling $92,108,518 worldwide. The film was released in the United Kingdom on December 11, 1998, and opened on #3, behind Rush Hour and The Mask of Zorro. The scene slots between Hallie and Martin meeting at Heathrow Airport, and Hallie meeting her mother and grandfather. Hallie is in a limo and they come across Buckingham Palace. She gets out and tries to get one of the guards to move. The guards then crowd around in formation as Elizabeth II of the United Kingdom exits Buckingham Palace in a car. The window rolls down and Hallie speaks to the Queen, getting confused with 'Your Highness' or 'Your Majesty' or whether to curtsy. The Queen promises not to tell a soul and moves off. Director Nancy Meyers had a difficult time getting the uniforms, location, and an actress to play the Queen. The scene was deleted due to pacing problems. Another deleted scene appears in the trailer that debuted in 1998. The scene shows Hallie standing out on the deck of her vineyard-estate house. She sees a shooting star and sings the rhyme "Star Light, Star Bright". Annie appears standing outside her window, too. In the original draft of the script, many scenes are altered or deleted. An extended ear-piercing scene is in. While putting the needle through Annie's earlobe, Hallie screams and passes out. Annie gently smacks Hallie in the face, trying to wake her up. After Hallie wakes up, she asks Annie, "Are you bleeding to death? Did it hurt?" Annie tells her no to both questions and shows Hallie the needle again, and tells her to finish with the other because she (Annie) will not go through life with just one pierced ear. Hallie passes out again. In an extended scene, Elizabeth delves further into why she and Nick did not stay together long. She says, "I tried living in California, he tried living in London...". Hallie replies, "So you broke up?" Elizabeth tells Hallie that she and Annie were the best thing about the whole situation and they continue to stroll down the streets of London. There is an extended ending where Hallie tells Annie: "You guys are going to love living in California." To which Annie replies: "California? You guys are going to love living in London." Then Hallie replies "London?" In the front yard, Sammy is barking to the poodle next door as Chessy and Martin are kissing and Charles is getting home. In February 2018, it was revealed that remakes of several films are in development as exclusive content for Walt Disney Studios' upcoming streaming service Disney+; with one of those named in the announcement being The Parent Trap. ^ "The Parent Trap: 128 minutes (Starz 01/2010 Schedule, Page 4)" (PDF). Archived from the original (PDF) on May 26, 2015. Retrieved November 19, 2017. ^ "The Parent Trap". AFI Catalog. American Film Institute. Retrieved 25 April 2018. ^ "The Parent Trap (1998)". British Film Institute. Retrieved 25 April 2018. ^ Knott, Matthew Hammett (May 29, 2014). "Heroines of Cinema: These 10 Female Filmmakers Prove Why Hollywood Studios Should Change Their Tune | IndieWire". IndieWire. Retrieved December 25, 2016. ^ a b "The Parent Trap (1998)". Box Office Mojo. Retrieved 2011-07-27. ^ Kawano, Kelley (June 26, 2012). "Let's Get Together: An In-Depth Look at the Ongoing Appeal of Hayley Mills' 'The Parent Trap'". Wordandfilm.com. Retrieved November 9, 2014. ^ "The Parent Trap - Production Notes - About the locations". CinemaReview.com. Retrieved August 16, 2013. ^ "The Parent Trap (1998)". Rotten Tomatoes. Retrieved February 8, 2014. ^ Siskel, Gene (July 31, 1998). "Parent Trap Repeat a Worthy Trip". Chicago Tribune. Retrieved November 28, 2017. Ebert, Roger (July 29, 1998). "The Parent Trap". RogerEbert.com. Retrieved November 28, 2017. 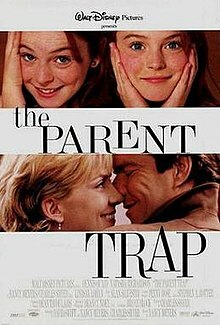 ^ "Kenneth Turan: The Parent Trap". Los Angeles Times. July 29, 1998. Archived from the original on August 4, 2012. ^ "Celebrity Central: Lindsay Lohan". People.com. Archived from the original on January 31, 2010. Retrieved January 31, 2010. ^ "Lindsay Lohan: Biography: Rolling Stone". Rolling Stone. Archived from the original on January 31, 2010. Retrieved October 4, 2014. ^ "20th Annual Awards". The Young Artist Foundation. Retrieved October 18, 2009. ^ "Weekend box office 11th December 1998 - 13th December 1998". www.25thframe.co.uk. Retrieved 21 February 2017. ^ Continuity photos of this scene exist, so it can be assumed that some filming took place.